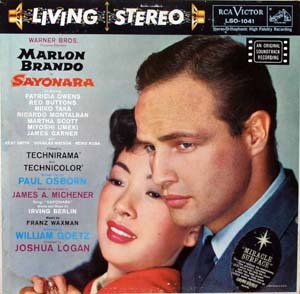 1958 Goetz & Logan Sayonara Living Stereo LSO-1041, Starring Marlon Brando & Patricia Owens, music by Franz Waxman and Irving Berlin. The record includes: Opening and Sayonara, Eileen, By the Bridge and Sayonara, Katsumi Theme, Sakura and Matsubayashi Theatre, Hana-Ogi, Sayonara, Street Fight, Death Scene and Sayonara, The Wig Room and Sayonara, Finale & Sayonara. Cover near mint, Vinyl lightly scratched. Satisfaction Guaranteed!